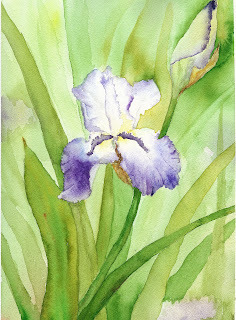 Last Thursday I went to the SCVWS Plein Air group's paint site-Nola's Iris Farm-in the east foothills. The panoramic view of the Santa Clara Valley (aka Silicon Valley) was stunning, and the irises were in full bloom. 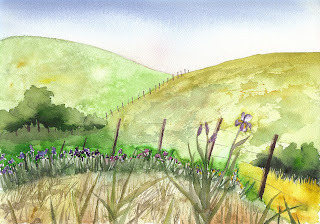 I did 2 paintings, one of a single iris bloom, and one a hillside view. The bud on the single iris worked out beautifully. The leaves...not so much. Both are on a 9x12 Arches block. I also tried out a new Tombo water soluble pen with a water brush. I only bought 1 pen-black-and the black iris I drew with it is a little bit creepy looking! Who wants to see a black flower???!!? I'm not posting that one!